Don Carlos Personal Reserve and Eye of the Shark should be reaching stores around the holidays. If you haven't been lucky enough to try a cigar from Carlos Fuente Sr.'s personal stash, you might get your chance soon. In celebration of his 80th birthday this year, the Arturo Fuente company patriarch has released his private blend to the public under the brand name Don Carlos Personal Reserve, and they should be reaching cigar stores around the holidays. It's a slightly adjusted version of the commercially available Don Carlos blend, although altered to Fuente's personal taste. Boxes of the Don Carlos Personal Reserve cigars are sitting in Fuente's Tampa warehouse waiting to be staggered into the market. 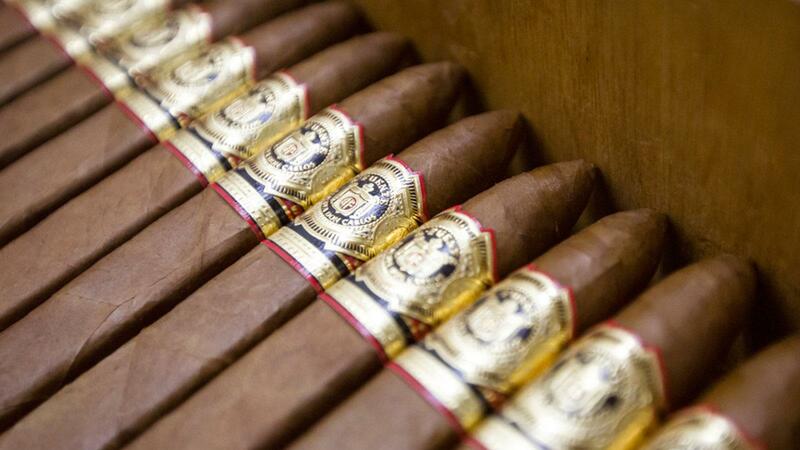 "Each generation of the Fuente family has created their own blend," explained Sam Mendez, general manager of the Fuente cigar factory in the Dominican Republic. "The founder, Arturo Fuente's personal cigar was a 6 inch by 47 ring corona gorda. The Fuente family started producing it commercially in his honor as the Flor Fina 8-5-8. Of course the Fuente Fuente OpusX is Carlos Fuente Jr.'s personal blend. But Carlos Fuente Sr.'s personal cigar is the Don Carlos Robusto. He continued to secretly tweak the blend, but only for his personal use." The Don Carlos Personal Reserve comes in a 5 inch by 50 ring Robusto with a suggested retail price of $14. A box-pressed belicoso called the Don Carlos Eye of the Shark ($11.95), measuring 5 3/4 by 52 will also be released around the same time. The Robustos come packaged in glossy black boxes and feature an all-Dominican blend save for the wrapper, which comes from Cameroon. The Eye of the Shark however, comes in glossy red boxes and the company is not yet disclosing the particulars of the blend. Attendees of the IPCPR trade show this summer were able to get a sneak preview of the cigars, as they were on display behind glass in Fuente's pavilion booth. In addition to the Carlos Fuente Sr.'s 80th birthday, this year also marks the 30th anniversary of the Don Carlos brand.